Texas based company Galarraga Industries uses the power of SM Infinity™ to manage multiple businesses advertising under one roof. 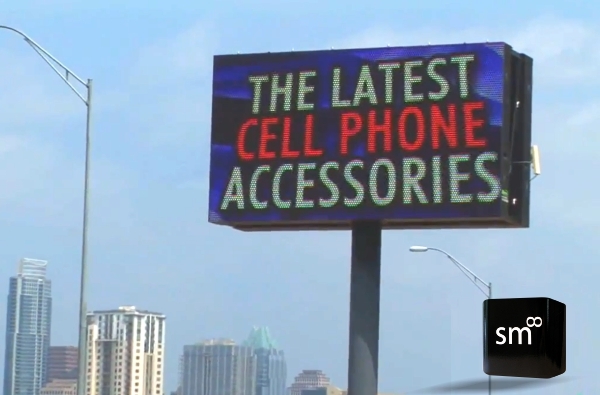 While traveling on IH-35 in Austin, TX, it is hard to miss the impressive LED sign just south of riverside drive. 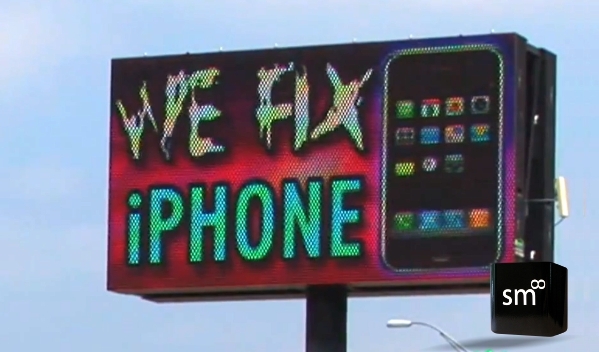 Originally installed in 2010 by Houston based company ADvantage LED, the sign was purchased to draw more customers into the multi-use property. It is home to a variety of businesses including All Cell Repair, Premiere Insurance, and EZ Designs, all owned and operated by Galarraga Industries. Even though the sign was a huge success, it placed a heavy time burden on owner and operator, Julie Galarraga. She not only had to generate new marketing ideas, but also had to physically create the content which didn’t always reflect her vision. So, Julie made the decision to partner with SM Infinity™ to manage these tasks for her. As a forward thinking business woman, Julie understands the importance of marketing in order to reach the desired clientele. In 2010, when others were closing their doors due to the recession, she made the choice to invest in an LED sign to stay ahead of the competition. Julie was working hard to create effective messages, but it was taking valuable time away from her business. SM Infinity™ alleviates this burden by creating fresh marketing strategies along with professionally designed dynamic content to maximize the advertising potential of her LED sign. Spectacular Media (the 5th Element of Digital Advertising) is a software savvy, social advertising company. They want to create a perfect synergy between these 4 elements: Business and People; Advertising and Digital Display. With the premier release of InfinityTM, cloudware for comprehensive digital advertising, they aim to meet the advertising demands of the LED digital display market (and more) creating a synergy between the Business and People. Galarraga Industries LED Sign on SM InfinityProfessional Content & Marketing Services Galarraga Industries LED Sign on SM Infinity CloudwareFocus on your Business and we'll focus on your LED Sign.